SnapQuotes is the fastest, easiest way to edit & share your photos! Connect with friends and share your best Snaps with the Own or Lovable Quotes! 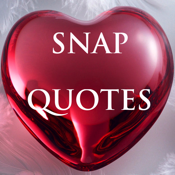 SnapQuotes is the coolest and easiest way to snap a photo with your camera phone, edit it with built-in or custom effects to make your Snap with colorful Quotes, then share it with your friends. It’s still the easiest and coolest way to snap, style and share your photos! Snap Quotes: The original app that adds hilarious captions to your photos.